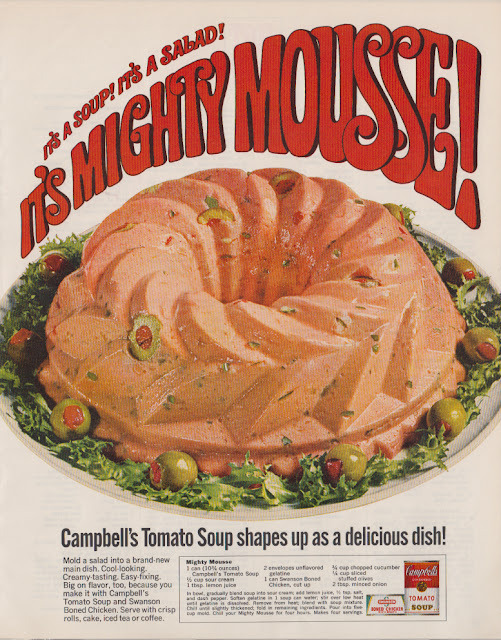 Golden Oldie Ads | A collection of favorite ads from a periodically obsessed collector of such things. View the whole collection on Facebook. 1965 Dr. Pepper. Does anyone remember drinking Dr. Pepper as a hot drink? 1965 Chesterfield King Cigarettes. They satisfy! Especially for those who hate those pesky filters filtering out deadly toxins. More toxins please! 1965 Condatina tomato sauce coupon. By today’s standards, 6-cents is nothing but back then it was nothing to sneeze at. 1965 Schlitz Beer. This is obviously a dude who doesn’t have to clean his own floors. 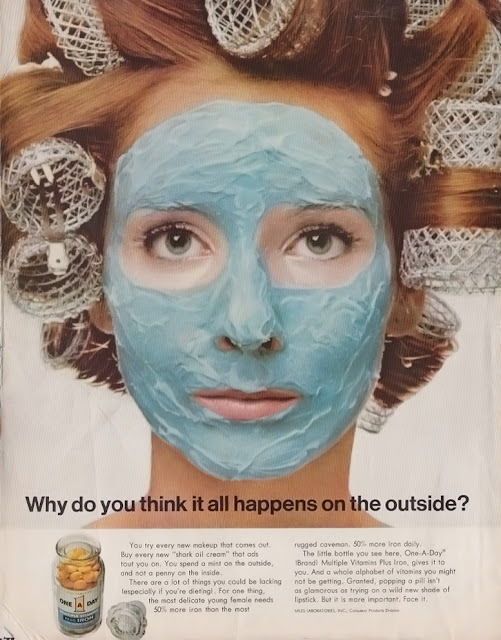 1965 Tampax. Feminine Hygiene has always been a mystery to me but it much less perplexing than the advertising for it. Pop, Crackle and Snap have been around a long time, since 1933 as it turns out. 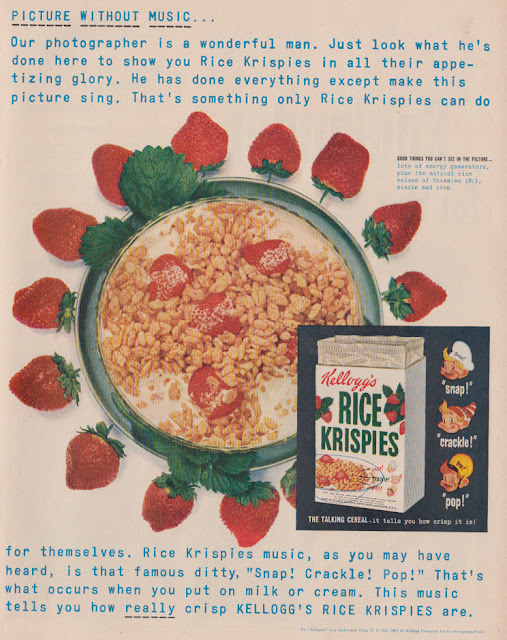 Notable bits about this particular advert include the fixed-width font that today would make us think of a primitive computer printout. Given that it’s 1951 though, they’re doubtless going for a typewriter but I fail to see how that businesslike formality will help them sell cereal. As in all breakfast ads the milk is stone white but in 1951 it might well have been whole milk (or cream) which really is fairly white. Lastly note that the inner bag design seems to be of wax paper. I wish the bags of my cereal boxes opened up so tidily. 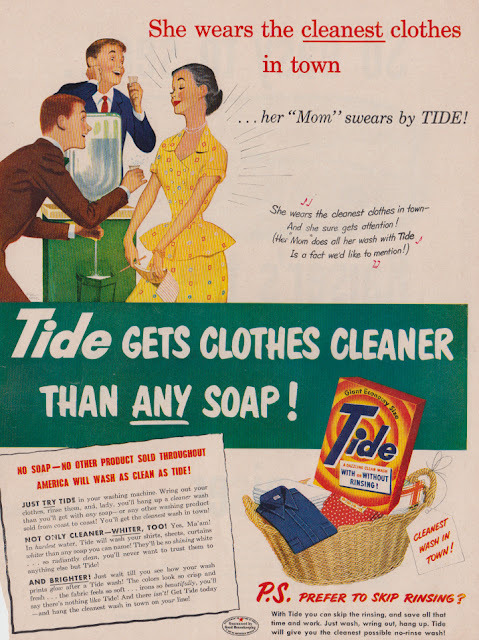 She wears the cleanest clothes in town … her “Mom” swears by tide. Who is this “Mom” person and why is she in quotes like that? The text is straightforward and forceful and the reaction of the gents at the water cooler seems proof that the horrid yellow dress she’s wearing really is attention-grabbing. Note how the guy in the brown coat is just letting the whole jug splash into the drain. This stuff must be good. Further, the detergent is so magical that you don’t even have to rinse anything. Just wash, wring out and hang up! How easy is that? I’d hate to see the rash you get from wearing soapy clothes all day. There are several things about this advert that get ones attention. Firstly, the hairstyle is to die for. Geometry all the way. The photo just screams 1960s. I’m also stunned at the text which indicates that most laundry detergents require over a cup of detergent per load. Even a large box wouldn’t last more than a couple of weeks. Perhaps people just didn’t wash their clothes as frequently 50 years ago? 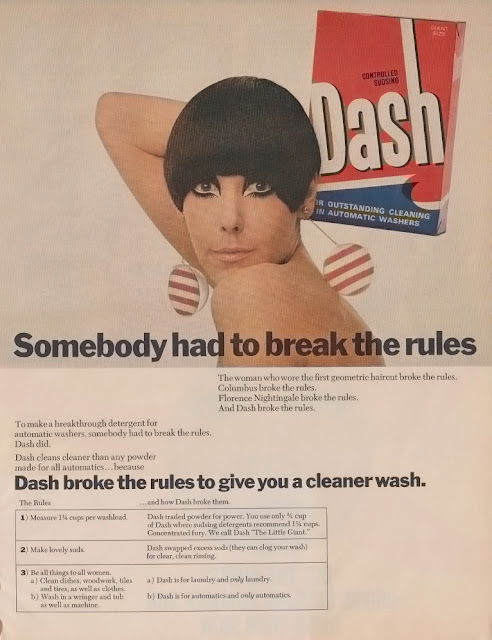 It’s also noted that unlike other detergents, Dash is for laundry only. This was apparently a novel idea in the day. Oh, and keep in mind that you can’t use Dash with your tub and wringer. It’s only for automatic washers. Yeesh. This ad makes me want to get on a soapbox in about 10 different ways. Firstly, I’m vastly unimpressed at the picture this paints of women. Apparently they’re vain and shallow creatures who go to ridiculous lengths for something as vaguely defined as ‘beauty’. It’s always been my long-held belief that the cosmetic industry is self-perpetuating. Just leave your faces alone and they’ll be just fine. Apparently too the average woman in 1967 was dieting and found nothing more exciting than trying on a new shade of lipstick. *grumble* At least the advertisers are trying to emphasize health in some vaguely selfish way. 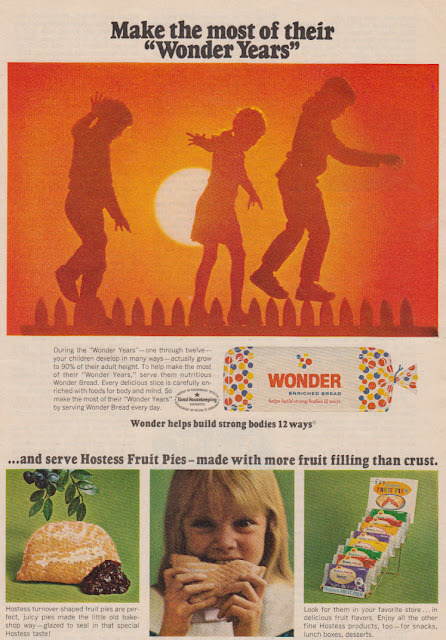 1967 Advert for Wonder Bread and Hostess Fruit Pies. But honestly, who would let their kids walk on top of a fence in this day and age? It seems somewhat apropos that such a strange little duo would be found selling such a strange-looking device. The camera was simple in that it simply took two pictures at the same time from two viewpoints. When you looked at the photos through the viewer, which just made sure that your left eye got one picture and your right eye the other, then you saw the result as three-dimensional. This concept was almost as old as photography itself but during the 50s entered wider use with cameras like this one costing only(!) $182. Adjusting for inflation this is a $1,500 camera, folks. Edgar Bergen and Charlie McCarthy are hawking this little device and as I’m sure you ALL remember from the 30s through the mid 50s they were a hilariously popular radio ventriloquist duo. Let me just allow that to sink in a bit. They were ventriloquists… and they were primarily known for “appearing” on the… radio… yes, yes indeed, that ancient device in which you can hear the people doing the show but can’t actually see them so you would never be able to TELL that one half of the conversation was held up by a wooden dummy. It never ceases to amaze me how creepy they both look in print advertising and how redundantly they use jokes of the form “Charlie’s no dummy he uses product X!” But if it worked then so be it.